The great revolutionary fighter Emiliano Zapata is an iconic Mexican figure. He is such a powerful symbol of revolution that a group from Chiapas took up his name in becoming 'The Zapatistas' back in the 1990's. 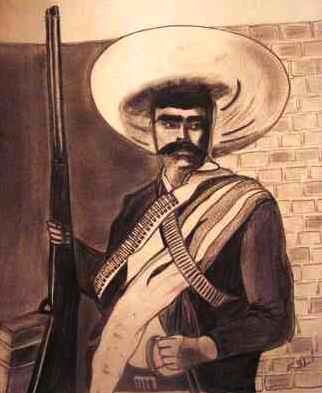 Zapata was the leader of the 1910 revolution that ended an unhealthy 40 years for Mexico, under the dictatorship of Profirio Diaz. He has become the poster-boy for revolution, along with others like Pancho Villa who was an accomplice. Unfortunately the revolutionaries failed to set up a stable government after stripping Diaz of power. There was a string of rulers fighting (sometimes to the death) over the top job in the years following the revolution. And for as long as there is bad government in Mexico (which is almost always) the image of Zapata will stay clear in the minds of the Mexican people.